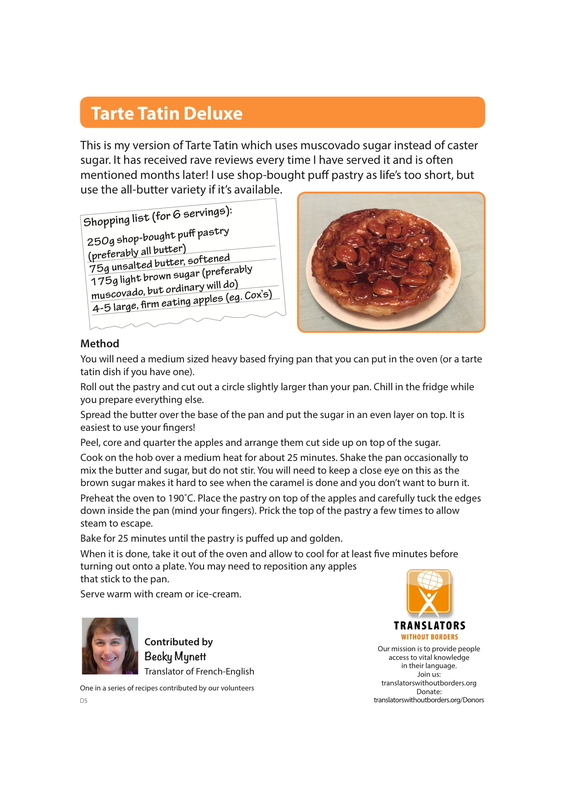 This is my version of Tarte Tatin which uses muscovado sugar instead of caster sugar. It has received rave reviews every time I have served it and is often mentioned months later! I use shop-bought puff pastry as life’s too short, but use the all-butter variety if it’s available. You will need a medium sized heavy based frying pan that you can put in the oven (or a tarte tatin dish if you have one). Roll out the pastry and cut out a circle slightly larger than your pan. Chill in the fridge while you prepare everything else. Spread the butter over the base of the pan and put the sugar in an even layer on top. It is easiest to use your fingers! Peel, core and quarter the apples and arrange them cut side up on top of the sugar. Cook on the hob over a medium heat for about 25 minutes. Shake the pan occasionally to mix the butter and sugar, but do not stir. You will need to keep a close eye on this as the brown sugar makes it hard to see when the caramel is done and you don’t want to burn it. Preheat the oven to 190˚C. Place the pastry on top of the apples and carefully tuck the edges down inside the pan (mind your fingers). Prick the top of the pastry a few times to allow steam to escape. Bake for 25 minutes until the pastry is puffed up and golden. When it is done, take it out of the oven and allow to cool for at least five minutes before turning out onto a plate. You may need to reposition any apples that stick to the pan. Serve warm with cream or ice-cream.